A Proton rocket blasted off in frigid subzero weather late Thursday and successfully delivered a direct broadcasting satellite into orbit for Latin America more than nine hours later. Enduring temperatures of -18 degrees Fahrenheit, the 184-foot-tall Proton rocket lifted off at 0039 GMT Friday (7:39 p.m. EST Thursday) from the Baikonur Cosmodrome in Kazakhstan. After surpassing the speed of sound, the Proton released its spent first stage two minutes into flight as the launcher reached the upper atmosphere. The Proton's second and third stages put the vehicle's Breeze M upper stage and the Intelsat 16 satellite into a ballistic trajectory less than 10 minutes after liftoff. The Breeze M fired up its main engine for four minutes to place itself in a parking orbit about 15 minutes into the mission. A second Breeze M burn one hour later began raising its altitude and reducing its orbital inclination. Two more Breeze M burns were accomplished overnight, eventually sending the 5,401-pound spacecraft in a near-geosynchronous orbit with an altitude of more than 23,000 miles and an inclination of zero degrees. The upper stage deployed Intelsat 16 at 1014 GMT (5:14 a.m. EST), according to Intenational Launch Services, the U.S.-based sales firm for commercial Proton launches. Intelsat 16's small size allowed the powerful Proton booster and Breeze M upper stage to propel the payload directly to its high-altitude perch above Earth. Most communications satellites are left in egg-shaped transfer orbits, and the craft's on-board propulsion system must finish the job. The direct injection of Intelsat 16 means the satellite will conserve precious maneuvering propellant, extending its useful life. The spacecraft may have enough propellant for up to 25 years, long beyond its 15-year design life, according to Ken Lee, Intelsat's senior vice president of space systems. Intelsat 16 will nudge itself into its operational slot in geosynchronous orbit, appearing to hover over the equator at 58 degrees west longitude. After several months of testing, the satellite will enter service providing HDTV news, sports and entertainment for SKY Mexico and SKY Brazil, local broadcasting subsidaries of DirecTV. Built by Orbital Sciences Corp., Intelsat 16 carries 24 Ku-band transponders and two deployable antennas for its communications mission. The craft will be operated by Intelsat on behalf of SKY Mexico and SKY Brazil. Intelsat 16 will double SKY Mexico's current capacity and serve as a backup for the SKY Brazil network. The satellite will back up Intelsat 11 and compliment the 10-year-old Intelsat 9 spacecraft, according to mission officials. 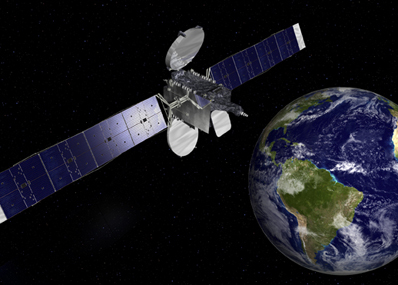 "The launch of IS 16 is critically important for our Latin American customers," said David McGlade, CEO of Intelsat. "Their [direct-to-home] business is growing so rapidly. We're bringing refreshed capacity into the markets, and better resilience." 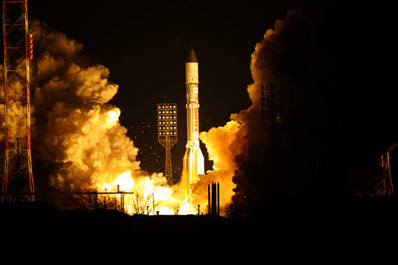 Intelsat 16 is the sixth company satellite launched on a Proton rocket since 1997. The spacecraft was originally contracted to fly to orbit on a Land Launch Zenit rocket, but financial trouble and delays with Sea Launch caused Intelsat to switch to the Proton marketed by U.S.-based International Launch Services. "Last year and this year, including the Intelsat 16 mission, we've been able to accommodate the needs of our customers when they needed to get launched on time and successfully," said Frank McKenna, ILS president. ILS has signed seven contracts with former Sea Launch and Land Launch customers since late 2008. Intelsat 16 moved to the Proton rocket in March 2009. McKenna said ILS plans eight commercial Proton flights in 2010, plus four or five missions for the Russian government. There may be room for another one or two launches this year, according to McKenna. Khrunichev, the Russian prime contractor for the Proton rocket, has ramped up production of the workhorse rocket to between 12 and 14 vehicles annually. The next Proton launch is scheduled for March 2 with three Russian government Glonass navigation satellites. A commercial mission carrying EchoStar 14 is on track for mid-March, an ILS spokesperson said. The SES 1 communications satellite will be the next commercial Proton flight after EchoStar 14, occurring some time this spring.